This is the information and news update portal of the Continuity Forum focused on Business Continuity and Resilience Management related Standards and related matters. 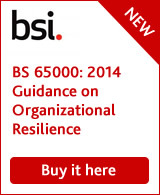 Through these pages we'll bring you the latest information on the developments in the world of Standards affecting Business Continuity, Resilience, Emergency Management, Security and Crisis Management. A significant amount of our day to day work involves working within the various standards bodies committee structures on developing and maintaining Business Continuity and Resilience based standards in the UK and Internationally. We represent the views of users, consultants and service providers where we provide consistent support, contribution and continual development for the sector. Our extensive knowledge of Business Continuity and Resilience standards and regulation covers public and private sector organisations of all sizes and types ... no matter what the question help is just a phone call away! Our involvement in developing standards for Business Continuity started in 2000 when a wide group of organisations including BSI, Loss Prevention Council, ABI, BCI and representatives from government, as well as industry experts and leading companies met at Burnham Beeches Hotel in Buckinghamshire for the first special industry summit. The Continuity Forum presented the findings and recommendations from a year long research programme looking at the emerging Business Continuity Sector and what was needed to provide a sound foundation for development and growth. The results recommended that three key pillars were needed to be worked on ensure the development of the sector into a mature discipline. Significantly, the pillars needed a solid foundation that provided, through industry consensus, definitions and a proper framework that properly described the whole disciple of Businsess Continuity. In other words, Industry Standards. 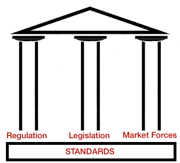 Within a year or so of the Summit, regulation had started to appear across a number of industry areas and the work to started on creating, firstly a Publicly Available Specification (PAS56) and then BS 25999 from the BSI that went on to be the most successful management systems standard in their history. The Continuity Forum are members of the BCM/1, SSM/1 and RM/1 committees of the BSI and the BCM.01 group from ASIS that developed the BCM.01 Standard for Business Continuity for North America. If you have any questions or would like to discuss how Business Continuity or Resilience may benefit your organisation please do get in touch and we'll be please to advice you.